I love using color! I have a tendency to use vibrant color in my paintings because I just love the pureness of it and its pretty awesome how many colors you can make out of just the basic primary colors. The color wheel is probably one of the most useful tools that I use on a daily basis in my studio. 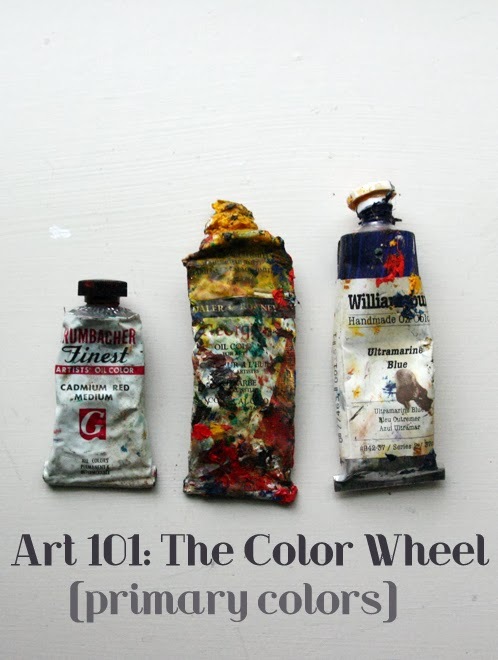 A color wheel is extremely important for not just making art, but also plays a huge role in vision and design. Anytime that I have a question about color and shadow, I refer to my handy dandy color wheel. It is a tool that illustrates the primary, secondary, and complimentary colors which comes down to color theory. This post is going to cover only primary colors, but don't worry part 2 will be coming soon. Color theory is pretty complicated but it seems like the most simple things are always the most complicated. right? What I have learned with practice and breaking it down into simple parts it can become easier. The three primary colors are based on our human vision- which is called trichromacy. Trichromacy are the three independent channels for conveying colors in our little eye balls. I have to say that I just feel smart by saying and using the word trichromacy. :) The color wheel is an extremely traditional form of color study and the first known source of a color wheel was Sir Isaac Newton in 1666. Primary colors are red, blue and yellow. The three colors can not be formed or made by any other colors combined. Primary colors are the root for every color combination possible- the foundation. There are some artists that only use primary colors and white- because they believe they can mix any color themselves by using these three colors, and typically they are called purists. If you mix all three colors in equal portions it makes black. Yellow (warm) is the most visible color of all colors, the human eyes processes this color first before any other color. It is a color that brings creativity and registers on the left side of the brain. Yellow is often used for signs to attract attention for traffic and is extremely common in advertising like those big yellow arches. Yellow is the color of hope and happiness. Red (warm) is the the second most visible color to the eye. Red is known to capture attention for things like stop signs or an emergency vehicle. Red focuses behind our eye retina which forces the lens to convex which is why we perceive red as moving forward. Red is generally a powerful color and one of the most expensive basic pigments. It has the longest wave length of light which is why its at the top of the rainbow. Red increases blood pressure, enthusiasm and action. Blue (cool) is a color that causes our eye lens to flatten. Blue is a common color for making things smaller and/or further away. Blue is often referred to soothing, spirituality, honesty and trust. This is barely scratching the surface of these colors and hopefully this is a good start to learning more about color because hey color is pretty important. Stay Tuned for Part 2! Next time its all about secondary and complementary colors and putting together a snazzy color wheel. yay! PS Want to read more on this non-art school series- click here. I remember having to paint a colour wheel in art university using gouache paint! Ugh! But, I still have that wheel somewhere and I learned a lot about colour. I have only recently gotten into painting being a pencil girl myself but I have had much fun teaching my boys about colour and the wheel. I don't think I realized that you couldn't combine any other colors to make the 3 primary colors! That's really interesting. I remember bits and pieces about this from art classes when I was a kid. I've never tried to create art using only the primary colors and white, though. That's a neat idea! I love color, too!! :D I have a color wheel hanging up in my room! Isn't it the most amazing thing how many colors can come out of just 3? Informative! I did a science fair project on the power of color on the human psyche. It truly is fascinating. Those paints in the picture look fabulous! I have a color wheel that I am slowly painting in, but I think I started with far too dark of a green...eek! In any case, I have plenty to learn about color and color mixing! Thanks as always for sharing your wisdom! Yellow is my prefeer one ! I love it! Yay! So glad you ended up sharing thoughts on creating your palette -- excited to see more of this series!